Waireki, a former world top-100 course. Thirty years ago, the world top 100 course rankings looked very different to what they do now. The elite was pretty much the same – Pine Valley, St Andrews, Augusta National, Royal Melbourne, Cypress Point, all the usual suspects – but somewhere down in the 40s or 50s, I’d always find a few courses that, to a young teen, seemed far too distant and just too exotic to be real. It’s not clear why, but most of these courses now struggle to cling on to a place in the ‘Top 100 Outside the US’ even, or have disappeared from the rankings altogether. For whatever reason, they aren’t nearly as illustrious or distinguished as they once were. A lot of great courses, no doubt better courses, have been built since I began taking notice of rankings – Sand Hills, Pacific Dunes, Barnbougle Dunes, and Kingsbarns to name just four. It could be the remote courses in the old lists didn’t age as well as the Old Course, Muirfield or Merion for instance. Or it might simply have been about editors and their publications wanting to seem better-traveled and worldly-wiser than they actually were. I remember two of these mysterious layouts in particular – Wairakei GC in New Zealand, and Bali Handara on a small island off the coast of a country called Indonesia which, judging by the photos, appeared to play through an impossibly lush and impenetrable jungle with wild, hairy and, no doubt, dangerous animals all about you. I was fortunate to play both in my mid-20s. Wairakei, opened in 1975 and designed by a former English Navy Commander named John Harris together with Peter Thomson and Mike Wolveridge, is found just outside the lovely town of Taupo on NZ’s North Island. While beautiful and thoroughly enjoyable, I do remember wondering how it had managed to earn quite so high a position among the world’s best. 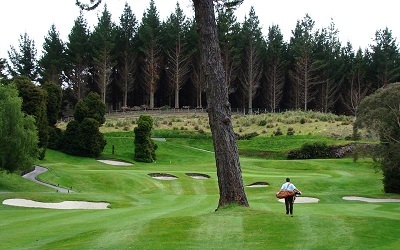 Wolveridge returned in the late 1990’s to renovate it and, though recent reports have been good, Wairakei barely squeezes into NZ’s top ten now having been overtaken by the likes of Cape Kidnappers, Kauri Cliffs, and the nearby Kinloch designed by Jack Nicklaus. At Bali Handara, another Thomson/Wolveridge design (total coincidence I assure you. I wasn’t on a Thomson/Wolveridge world tour), I had much the same impression - amazing location (pure mountain lakes and an equatorial rain forest in a vast volcanic crater), exquisite conditioning, excellent course…but world’s top 100? Really? Again, despite all the positives, I do remember feeling slightly underwhelmed, plus I didn’t get chased by any savage animals. It was really no great surprise, therefore, to learn Handara isn’t even ranked in Indonesia's top ten anymore (according to one respected web site). Like Wairakei, it has been eclipsed by courses built during the boom of the ‘90s and early 2000s such as Greg Norman’s Nirwani Bali and Gary Player’s Ria Bintan. In the US, Britain, Australia, South Africa, and Japan, old golf is revered. In many other parts of the world, newer is decidedly better.